Please read the blog carefully before judging it. I couldn’t believe 2017 already seems like a distant dream which taught many things and left behind footprints of long-lasting memories leaving no stone unturned. 2018 has begun with the much usual fanfare and exuberant celebrations. I would like to wish everyone a very Happy New Year. The days are waiting to whiz past us, the way Steve Smith scores century in Test matches. Time has already begun to trickle down making it a very valuable thing leaving us to use it to the utmost. Every New Year is like a blank journal waiting for us to fill its chapters with anecdotes, memorable events, rag to riches stories or the usual failures/successes of that year resolutions. It’s up to us to use it to the maximum and learn something from it. We would have hordes of dreams within us, we wish that would come true over this year and hope for better, joyous days. But remember one thing, Everything that happens in this year is an experience you are going to cherish for your entire life. It’s a valuable lesson that life bestows upon us. So hope for the best and prepare for the worst. Because you have got one life and I think living it once and making the most memories out of it is enough. Once Again wishing you an awesome year ahead. Wishing you a wonderful year ahead. Let this year be fun filled and useful. Hi Durga Prasad, Thanks for the comment. Hope yours too is a great year. © Jonty, 2018. Unauthorized use and/or duplication of this material without express and written permission from this site’s author is strictly prohibited. 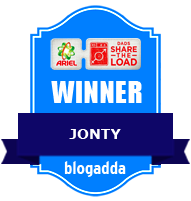 Excerpts and links may be used, provided full and clear credit is given to Jonty with appropriate and specific direction to the original content and the mention of the blog.